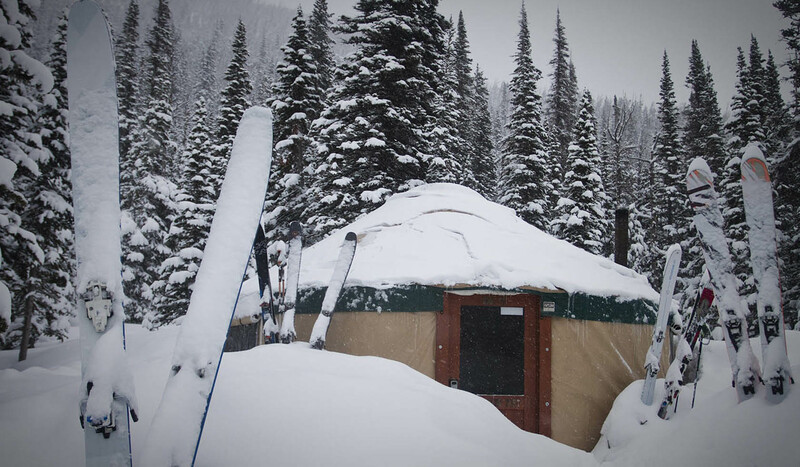 At Bell Lake Yurt, peaks soar to over 10,000 feet just outside your door, snow piles up by the meter, and terrain for any skier or rider stretches endlessly in all directions. Here, there are no motors; no crowds; no distractions. Just you, your friends and the entire Tobacco Root Mountain range as your playground. With 43 peaks higher than 10,000 feet, the Tobacco Roots are high, wild and pristine. As part of the Greater Yellowstone Ecosystem, the Tobacco Roots are home to wolverine and grizzlies, mountain goats and bighorn sheep. The entire Bell Lake basin is designated non-motorized, so the snow stays fresh and the air silent. Despite its wildness, however, Bell Lake Yurt is easy to reach. A moderate, 2.5-mile ski brings you from the trailhead to a protected meadow at 8,500 feet, where the yurt is nestled between snow-cloaked Whitebark pine and Douglas firs. Through the front door window, study the impressive, 2,000-foot couloirs of Branham Peak while dinner sizzles on the stove. Enjoy a tour up to beautiful Bell Lake, where the mountains unfold, offering runs from mild to wild. Memory foam mattresses, a solar LED light system, and a fully equipped kitchen ensure your comfort after a long day of skiing untouched snow. Our cozy, 20-foot insulated wood and canvas yurt sleeps up to 6 guests, with plenty of room to move around, a mountain library and views like no other. Montana Alpine Adventures offers guided, catered trips that leave you free to relish the experience with none of the work; public and custom avalanche education courses to expand your knowledge and safety in the mountains; and self-guided yurt rentals for experienced parties looking for solitude and deep powder. Visit www.belllakeyurt.com for more information or to book your trip. Come explore with us at Bell Lake Yurt!